Is it ever wise to impulse-buy a book? Annoyingly the answer is sometimes yes and sometimes no. I’ve bought a lot of books over the years on the spur of the moment, both online and in bookshops that I’ve put on the shelf and then never bothered with again… luckily, that did not happen on my most recent foray into thoughtless purchasing of literature. The journey between my new home in Oxford and my mum’s house is long and dull, and goes through Paddington station. The last time I made this journey I popped into WHSmith’s for a magazine for the train and came out with Snow White Must Die by Nele Neuhaus. I have read crime before, but they were always what you would call literary crime – literary novels with a crime element, but not really classifiable as being in the crime genre. However I love crime and mystery TV shows and films, so I reckoned I should try a proper crime novel. I was attracted to the striking cover and the suggestions of a fairy tale, as well as the fact that Neuhaus has a very Scandinavian sounding name. She is in fact German and this is her first novel to be translated into English, though it is the fourth in a series. The series focuses on two police officers, Pia Kirchoff and Oliver Bodenstein, and Snow White Must Die follows them as they investigate the events following the release of a murderer from prison. Tobias Sartorius leaves prison in 2008 after serving ten years for the murders of his friend Laura Wagner and his girlfriend Stefanie Schneeberger – a girl everyone referred to as Snow White. He returns to his home in the small German village of Altenhain (a real place that Neuhaus used as inspiration for the setting) and his reappearance instantly dregs up old issues and emotions. It is a very close knit place where everyone has lived and known each other for years and years, and Tobias’ release turns everything on its head. 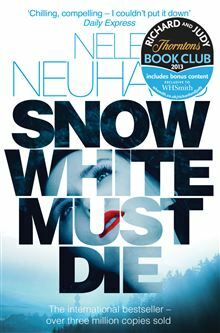 Snow White Must Die is part of Richard & Judy’s Book Club this year, and there are a couple of short interviews with Neuhaus at the back of the book. She says that she chose Altenhain as the setting because a village is the perfect setting for a murder mystery – a close knit community where everyone knows everyone else, and both characters and events do not get lost in the rush and clamour of a city. She has utilised this perfectly, as the truth of the events in 1997 and the surrounding years is slowly revealed. It is complicated, but not so much that you get lost or annoyed; in fact it is perfectly clever and extremely well planned. Every character has a role to play, every person is significant in some way, as is every action. When Tobias returns he discovers that his parents have lost the family restaurant and the farm because no one would go near the parents of a murderer; and that they have been divorced for several years, a fact they kept from him even when visiting him together in prison. Their entire lives have been destroyed by his conviction, and he feels an enormous sense of guilt. Tobias’ father now lives alone in their house, which is dilapidated and unloved. A rival restaurant, The Black Horse, has opened across the road that no doubt contributed to the decline of the Sartorius restaurant. There is a new family now living in Stefanie’s house, and their daughter Amelie, only seventeen and working as a waitress at The Black Horse, hears rumours about Tobias’ return and becomes curious about the events of 1997. Everyone seems to have known him and the two girls, and everyone seems to have opinions. She becomes increasingly fascinated by how a few drinks at the village fair could have lead a well-liked young man like Tobias to murder one of his oldest friends and his girlfriend. Amelie begins her own investigations, asking people questions and trawling the internet for the truth. Tobias cannot remember what happened on the night of the murders; he is the only person who is glad Amelie is asking questions. Pia and Oliver’s investigation builds when another young girl goes missing; this time it’s Amelie, a girl who bears a striking resemblance to Stefanie – ‘Snow White’. Everyone in Altenhain assumes that either Tobias or her friend Thies, autistic and mute, is responsible for her disappearance; but Pia is not so easily convinced. She is highly suspicious of the cruel and whispering residents of Altenhain who all dismiss Tobias as evil and Thies as stupid and odd and therefore dangerous. Pia Kirchoff is a brilliant character; she combines the familiar territory of the headstrong, determined female detective with a normal woman trying to get planning permission to extend her house and advise her ex-husband about his new extramarital affair. She is extremely well paired with Oliver Bodenstein – he is grumpy and unhappily married, with too many problems of his own to notice the intricacies of Tobias’ story. But when he’s good, he’s good. He excels as an interrogator and knows how to pin someone down and get the truth out of them. He is intellectual and yet also a tough guy; Pia is these things too. I warmed to these two characters immensely and cheered them on as they solved each little conundrum and raced to solve the next one. Neuhaus’ plot is complex and folded up into a tight ball, which is slowly unfolded, spread out and examined by Kirchoff and Bodenstein. Tobias is also an excellent character. He is dark and troubled, but also naive, fragile and bewildered by the new world he is thrust into. I could not guess the ending of Snow White Must Die. I could not guess what happened in 1997 or how deep the secrets went. There is action right up until the last second, and nothing in this book is as simple as it seems – the people especially. The next book in the series to be published in the UK is entitled Bad Wolf – and I will certainly be reading it. Originally published as Schneewittchen muss sterben by List in Germany in 2010. I read the 2013 Pan Macmillan edition, pictured above. Glad you liked it and that your impulse buy did not disappoint! I thought the repercussions of crime and lasting suspicions in a small community were brilliantly handled. It’s not a sensationalist novel, but solid and satisfying, a bit like German food.